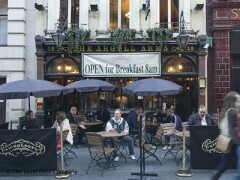 About: This pub is named after the Duke of Argyll who had a mansion on Argyll Street. The bar in this pub has been divided into three separate cubicles by partitions of etched and cut glass. They were originally introduced to separate the different social classes of the 19th century. The pub serves a good selection of food and ales. Catering for private parties of up to 100 guests is available upon request and seating is provided on the pavement area, weather permitting. Good Pub, gets very busy after work. reasonable prices for the area altho service is sometimes slow when busy. not trendy or fashionable but friendly enough. great location close to Tube so good place to meet up.